Smarties means two different things to a Canadian and an American. In Canada, we picture the colourful candy coated chocolate treats. I think of the old commercial from the 80s, “When you eat your Smarties, do you eat the red ones last?”. In the USA, Smarties are little candy tablets known as Rockets here. Same candy, different name. 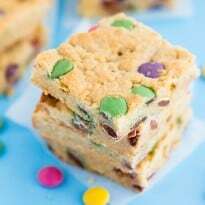 In this recipe, I’m using Canadian Smarties. If you’re in the USA and can’t find them, use another type of candy coated chocolate in its place or pick some up on Amazon. This post is not sponsored, but I did receive some of the spring themed Smarties to try. 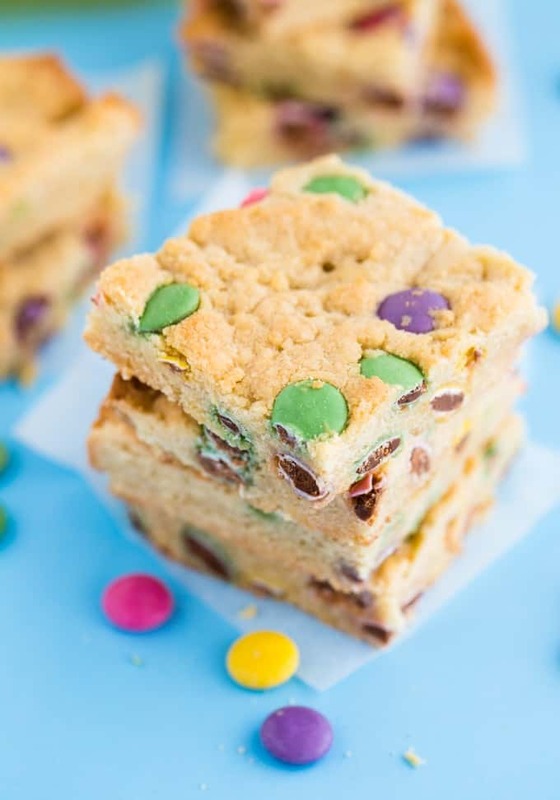 They also included a recipe for these scrumptious Smarties Blondies. I made them for my family and they turned out fabulous so I took some photos to share with you! I used the Smarties Spring Mix canister which is available for a limited time only. When it’s not Spring, use regular boxes of Smarties. The Spring Mix is filled with pastel colours and makes a pretty dessert, don’t you think? Are you a Smarties fan? 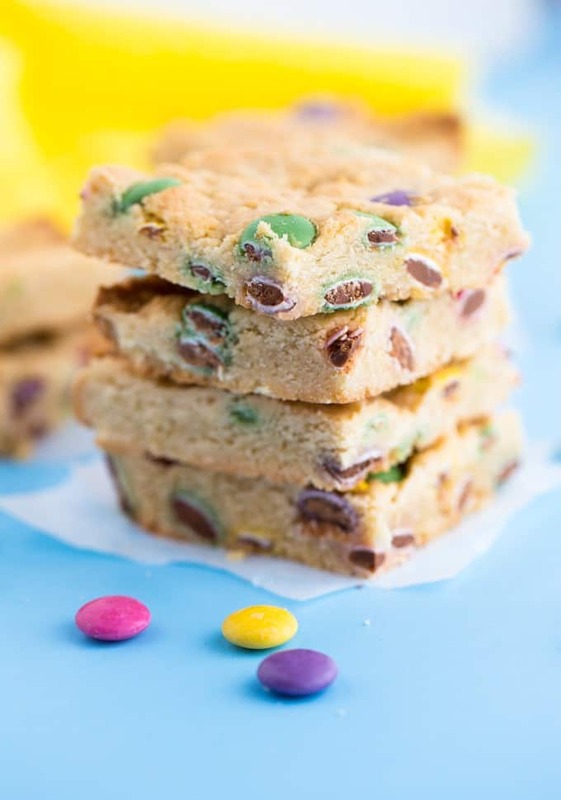 Chewy and sweet bars dotted with delicious candy coated chocolate Smarties. You may want to double the batch because these are gone in a flash! Preheat oven to 350F. Line a square baking pan with parchment paper and set aside. In a large mixing bowl, beat butter, brown sugar and sugar until combined. Add in egg and vanilla and beat to combine. Mix in flour and salt. Add in Smarties and mix to combine. Spread mixture evenly into baking pan. Bake for 20 to 25 minutes until golden brown. Cool completely. Cut into 9 squares. Yummy & easy to make so that is a bonus! Thanks for the recipe! These look really good, you had me a chewy, they would be good with my cup of coffee!! These look so yummy and delectable. I want to make them for my gang too.They look so perfect for spring with all the pretty colors in them. Mmm love Smarties! I’m sure we would love these! They have chocolate in them. That’s good enough for me. I need to find some time to make these! These sound yummy. I like the spring colors. I love the “lightened-up look” of these brownie alternatives! So yummy! Have not made blondies in quite awhile! Love the upgrade! Will have to try! These look delicious and seem easy to make. Can’t wait to try this recipe. They look like a nice treat. These look like so much fun! Love the colors – My kids will get excited about these!! I have 3 aunts who live in Canada, so my mom always has smarties in the fridge. Which means every time I go visit my parents, I eat way too many Smarties. But they’re so good!!! These look delicious! I’ll definitely try out this recipe! These look ever so tasty! Yum! These look so pretty and sound so tasty! I love bar cookies! They are so much fun to make and eat, and great for summer picnic and barbecue treats. I know that they certainly would not last long, my 16 yr old would gobble them up quickly. Thanks for sharing! Stopping by from Small Victories Sunday and hope you have a great week! These look incredible! 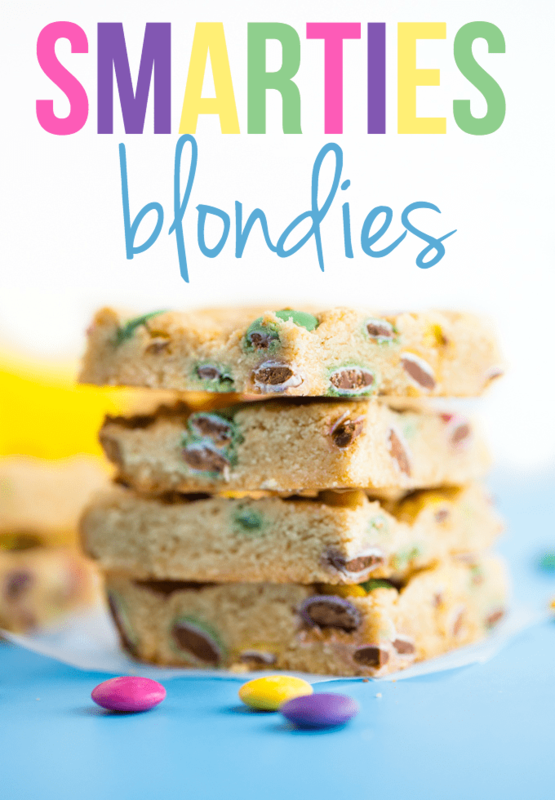 My husband loves Blondies, so I am definitely making these! Thank you for sharing them at the #SmallVictoriesSundayLinkup! What a yummy variation on a great standby. Can’t wait to try it! I think I have some Smarties stashed away!! Thanks for the snack for the day!